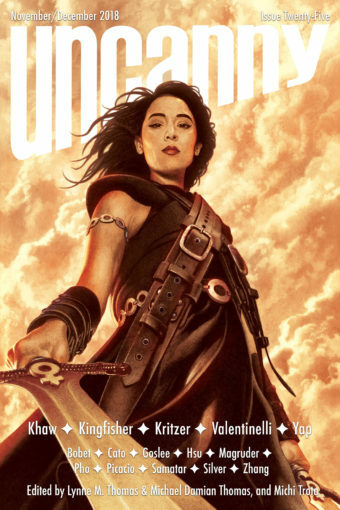 Welcome to Uncanny Magazine Issue Twenty-Five! All of the content will be available for purchase as an eBook (PDF, EPUB, MOBI) on November 6, 2018. The free online content will be released in two stages—half on November 6 and half on December 4. Featuring all-new short fiction by Isabel Yap, T. Kingfisher, Naomi Kritzer, Monica Valentinelli, and Cassandra Khaw; reprint fiction by Sofia Samatar; nonfiction by Diana M. Pho, Steven H Silver, Sarah Goslee, and Nilah Magruder; poems by Beth Cato, Hal Y. Zhang, Leah Bobet, and Sharon Hsu; interviews with Isabel Yap and Monica Valentinelli by Caroline M. Yoachim; and John Picacio’s La Valiente on the cover. Episode 25A (November 6): Editors’ Introduction, “The Rose MacGregor Drinking and Admiration Society” by T. Kingfisher as read by Erika Ensign, “cardioid” by Hal Y. Zhang as read by Stephanie Malia Morris, and Lynne M. Thomas interviewing T. Kingfisher. Episode 25B (December 4): Editors’ Introduction, “The Thing About Ghost Stories” by Naomi Kritzer as read by Stephanie Malia Morris, “Osiris” by Leah Bobet as read by Erika Ensign, and Lynne M. Thomas interviewing Naomi Kritzer. John Picacio is one of the most acclaimed American artists in science fiction and fantasy over the last decade, creating best-selling art for George R. R. Martin’s A Song of Fire and Ice series, as well as the Star Trek and X-Men franchises. Major clients include Penguin Random House, Tor Books, HarperCollins, Scholastic, Simon & Schuster, Subterranean Press, Pyr, Baen Books, Dark Horse Comics, and many more. 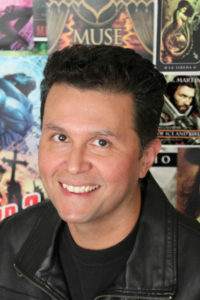 His body of work features major cover illustrations for authors such as Michael Moorcock, Harlan Ellison, Brenda Cooper, James Dashner, Frederik Pohl, Dan Simmons, Mark Chadbourn, Sheri S. Tepper, James Tiptree, Jr., Lauren Beukes, Jeffrey Ford, Joe R. Lansdale, and many, many more. His accolades include two Hugo Awards, eight Chesley Awards, two Locus Awards, two International Horror Guild Awards, the World Fantasy Award, and the Inkpot Award. In 2012, he founded his own creative imprint, Lone Boy, which became the launchpad for his Loteria Grande cards, a bold contemporary re-imagineering of the classic Mexican game of chance. In 2018, he became only the third person in 76 years to serve as Guest of Honor and Hugo Awards Master of Ceremonies at the same Worldcon. For more, please visit johnpicacio.com.